Rami Hamdallah issued a statement in response to the move by Israel’s national water company Mekorot, which saw water supplies suspended in the municipality of Jenin, several villages in Nablus, as well as the city of Salfit and its surrounding villages. 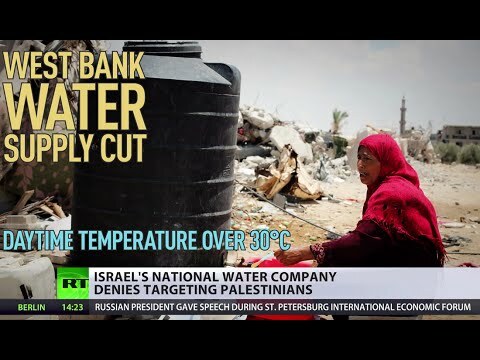 Israelis, including settlers, have access to 300 liters of water per day, according to EWASH, while the West Bank average is around 70 liters, below the World Health Organization’s recommended minimum of 100 liters per day for basic sanitation, hygiene and drinking. The move to deprive the villages of access to safe drinking water was seen as especially outrageous, as Palestinian Muslims celebrated the holy month of Ramadan, which entered its second week on Tuesday. Some areas reportedly had not received water for more than 40 days, according Al Jazeera. Palestinian human rights group Al-Haq estimated in a 2013 report that up to 50 percent of Palestinian water supplies are diverted by Mekorot over the summer months to meet the consumption needs of Israel’s illegal settlements. COGAT added that a Civil Administration team repaired a burst pipe line on Thursday, which had disrupted the water supply to the villages of Marda and Biddya in Salfit, Salfit city, the Tapuach area in Salfit, as well as the village of Jammain in Nablus. “The water flow has been regulated and is currently up and running,” they added. COGAT also claimed that water supply had in fact been increased in the evenings to meet the needs of those observing Ramadan, who fast throughout the day. According to Al-Haq, JWC holds complete decision-making power over the coordinated joint management and development of all water resources in the West Bank. The establishment of JWC more than two decades ago “should have been a positive reform for Palestinians,” Al-Haq wrote. However, their report notes that the consensus system enables Israel to veto any proposal by Palestinians to maintain existing water infrastructure or build new projects. Just half of Palestinian proposals for wells and improvement projects to the water network were approved by Israel between 1995 and 2008, compared to a 100 percent approval rate for Israeli projects, a study cited in the report found.